Welcome to Eckardt Johanning, M.D., M.Sc., Ph.D.
Our team of medical experts specialize in health problems related to outdoor and indoor mold exposures and water damage. We diagnose, treat and provide medical-legal testimony about your health problems and illnesses as a result of adverse health reactions from mold, bacteria, mycotoxins and other bioaerosols for more than 25 years. We collaborate internationally with world renowned experts and consultants around to provide state-of-the-art research and problem oriented solutions. Extrinsic allergic alveolitis also known as “humidifier fever” or "hypersensitivity pneumonitis"
Review of health hazards and prevention measures for response and recovery workers and volunteers after natural disasters, flooding, and water damage: mold and dampness. Johanning E, Auger P, Morey PR, Yang CS, Olmsted E.
Health problems and illnesses encountered by unprotected workers, first-responders, home-owners, and volunteers in recovery and restoration of moldy indoor environments after hurricanes, typhoons, tropical storms, and flooding damage are a growing concern for healthcare providers and disaster medicine throughout the world. Damp building materials, particularly cellulose-containing substrates, are prone to fungal (mold) and bacterial infestation. During remediation and demolition work, the airborne concentrations of such microbes and their by-products can rise significantly and result in an exposure risk. Symptoms reported by unprotected workers and volunteers may relate to reactions of the airways, skin, mucous membranes, or internal organs. Dampness-related fungi are primarily associated with allergies, respiratory symptoms or diseases such as dermatitis, rhinosinusitis, bronchitis, and asthma, as well as changes of the immunological system. Also, cognitive, endocrine, or rheumatological changes have been reported. Based on the consensus among experts at a recent scientific conference and a literature review, it is generally recommended to avoid and minimize unnecessary fungal exposure and use appropriate personal protective equipment (PPE) in disaster response and recovery work. Mycologists recommend addressing any moisture or water intrusion rapidly, since significant mold growth can occur within 48 h. Systematic source removal, cleaning with "soap and water," and "bulk removal" followed by high-efficiency particulate air vacuuming is recommended in most cases; use of "biocides" should be avoided in occupied areas. 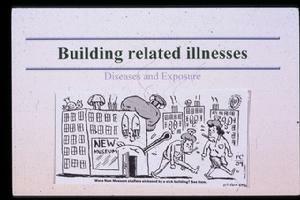 Public health agencies recommend use of adequate respiratory, skin, and eye protection. Workers can be protected against these diseases by use of dust control measures and appropriate personal protective equipment. At a minimum, a facial dust mask such as the National Institute for Occupational Safety and Health (NIOSH)-approved N95 respirator should be used for mold remediation jobs. For any large-scale projects, trained remediation workers who have medical clearance and use proper personal protection (PPE) should be employed. as well as neurological effects such as severe headaches, memory and concentration problems and others. Department of Health "Mold Guidelines". IN A WATER-DAMAGED OFFICE ENVIRONMENT. ABSTRACT: There is growing concern about adverse health effects of fungal bio-aerosols on occupants of water damaged buildings. Accidental, occupational exposure in nonagricultural setting has not been investigated using modern immunological laboratory tests. 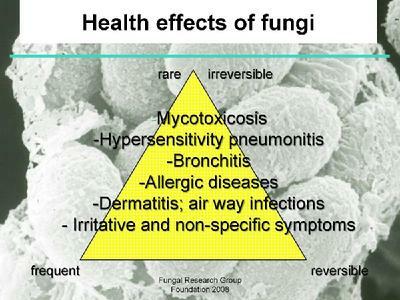 The objective of this study was to evaluate health status of office workers after exposure to fungal bio-aerosol, esp. Stachybotrys chartarum (S. chartarum)- and its toxigenic metabolites (satratoxin) and to study laboratory parameters or bio-markers related to allergic or toxic human health effects. Exposure characterization and quantification were performed using microscopical, culture and chemical techniques. The study population (n=53) consisted of 39 female and 14 male employees (mean age 34.8 years) who had worked for a mean of 3.1 years at a problem office site; a control group comprise 21 persons (mean age 37.5 years) without contact with the problem office site. Health complaints were surveyed with a 174 item standardized questionnaire. A comprehensive test battery was used to study the red and white blood cell system, serum chemistry, immunology/antibodies, lymphocyte enumeration and function. 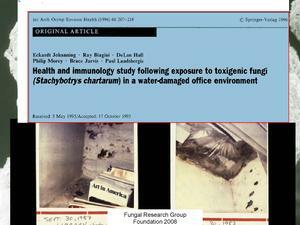 Widespread fungal contamination of water-damaged, primarily cellulose material with Stachybotrys chartarum was found. S. chartarum produced a macrocyclic trichothecene, satratoxin H-, and spirocyclic lactones. Strong associations with exposure indicators and significant differences between employees (n=53) and controls (n=21) were found for lower respiratory system symptoms, dermatological symptoms, eye symptoms, constitutional symptoms, chronic fatigue symptoms (CFS) and several enumeration and function laboratory tests, mainly of the white blood cell system. The proportion of mature T-lymphocyte cells (CD3%) was lower in employees than in controls, and the regression analyses showed a significant association of lower CD3% among those reporting a history of upper respiratory infections. Specific S. chartarum antibody tests (IgE and IgG) showed small differences (NS). It is concluded that prolonged and intense exposure to toxigenic Stachybotrys chartarum and other atypical fungi was associated with reported disorders of the respiratory and central nervous system, reported disorders of the mucous membranes and a few parameters of the cellular and humoral immune system, suggesting a possible immune competency dysfunction. for others search the AIHA office for further listings.